A collection of recent DAM-related articles from around the web, sourced from DAM Federation member, Planet DAM. DAM vendor MediaValet have recently published part one of a two-part series on DAM procurement. This first instalment focuses on the differences between two primary methods of deployment and delivery: On-Premise and Software as a Service (SaaS). Although the article leans slightly towards favouring a cloud-based approach (MediaValet’s own method), there’s still sufficient information for it to form a useful checklist for those seeking to procure a DAM system. Notable omissions in terms of pitfalls include privacy concerns, loss of access or data due to server failure, the risk of ‘vendor lock-in’, and the issues you might face should you wish to move away from a cloud-based solution. 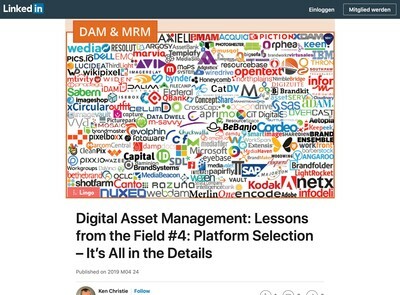 My co-contributor and DAM consultant Ralph Windsor has recently posted an article over at Digital Asset News. 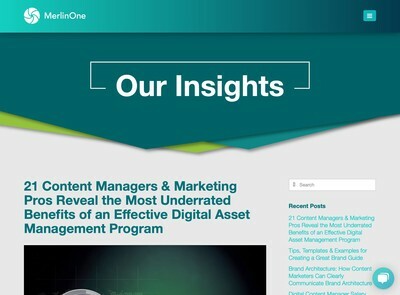 The item investigates the often misunderstood relationship between the intrinsic and extrinsic value of digital assets, and how modern digital businesses are exploiting this relationship to provide significantly greater growth and ROI than their competitors entrenched in the more conventional capitalist model, which tends to focus on the intrinsic value of material assets alone. This in-depth article deciphers and examines the challenges and opportunities that modern digital business face in this changing landscape. DAM provider Canto have published a thinly-disguised advertorial on their blog. 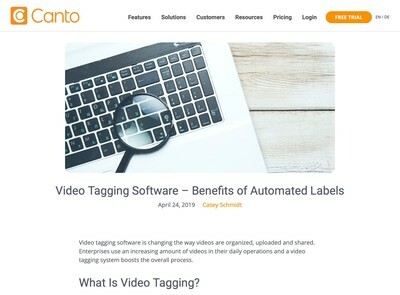 It’s a light-hearted look at the importance of organisation and housekeeping when cataloguing digital assets such as photos, videos and brand material. Likening a disparate and disorganised system to a jumbled snack counter might not be the most suitable analogy that springs to mind, and their appropriation and manipulation of Shel Silverstein’s “Underface” poem, although mildly endearing, might be perceived as somewhat trite in the context of brand management. Digital technology evaluation outfit Real Story Group have recently announced a “major overhaul” of their DAM vendor evaluation research. With yearly subscriptions for reports starting at a snip over $6000, it’s certainly a considerable investment that costs more than some of the DAM systems themselves. However, a look at the sample PDF excerpt (which presents an abridged evaluation of MediaBeacon’s R3volution platform) demonstrates a very high level of detail for both the technical aspects of the software and a background history of the vendor – concise and comprehensive insights that might possibly warrant such a high price tag. With around 30 DAM vendor reviews included, it’s really up to the consumer to gauge whether it represents value for money, especially if they’ve already shortlisted their options; an alternative approach might be to undertake the necessary research themselves, which, although more costly in terms of time and effort, could provide a more relevant appraisal. As a freely-available directory containing vendor-submitted information for around 100 platforms, damvendors.com is a good place to start such an undertaking. 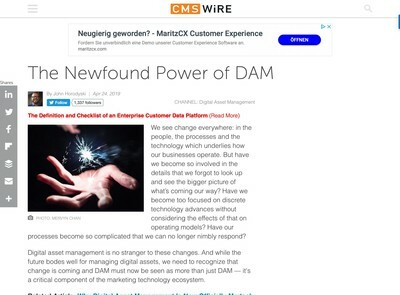 CMSWire contributor John Horodyski has published part two of his DAM Glossary series. With a total of less than thirty terms, it’s not the most comprehensive reference I’ve come across, and the fact that it’s not alphabetical or searchable might place it in the ‘content for content’s sake’ category. That said, it covers the most common words and phrases you’re likely to encounter as a novice DAM operator. For those seeking a more comprehensive community-based glossary with relational, narrower and broader links, and the option to become a contributor, damglossary.com is also available (ironically, it was established in direct response to an article by Henrik de Gyor way back in 2013, and subsequently reviewed later that year on CMSWire – perhaps further evidence that the DAM industry is still exhibiting signs of stagnation and being stuck in its own Groundhog Day).